This gradient is gorgeous! Why have I never tried doing a gradient with a glitter??? Fab idea! I know exactly what you mean! When my shades showed up I was like 'what on earth am I going to do with these particular three?' but I adore what you came up with! It's gorgeous. The gradient has such depth. Thank you for your comment also! Very clever to think of removing the hearts and using them on their own. I was also a bit baffled when I saw your 3 colours, but your genius has payed off again! 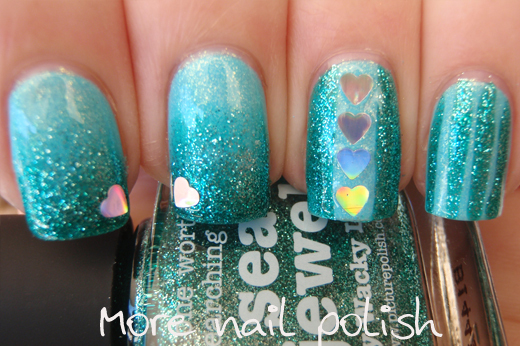 This is gorgeous - the hearts are a very pretty and simple accent! This is so pretty! 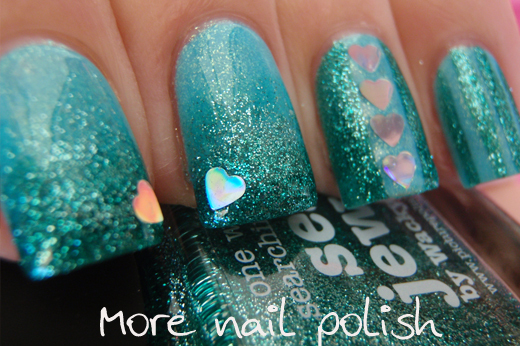 I love how sparkly Sea Jewel is!! This is lovely Cathy! Those definitely would be hard to use together, so cheers to creativity in pulling out the hearts to use! This is lovely! 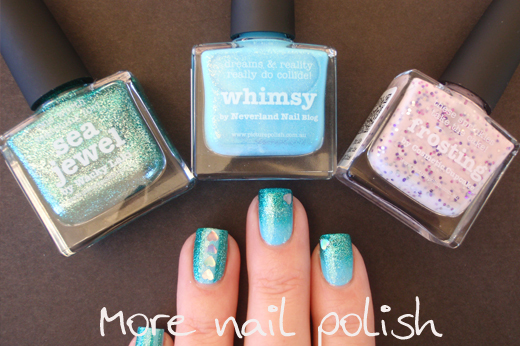 Sea Jewel and Whimsy look great together! this is stunning! i absolutely adore the colour and such a great glitter fade! Lovely! 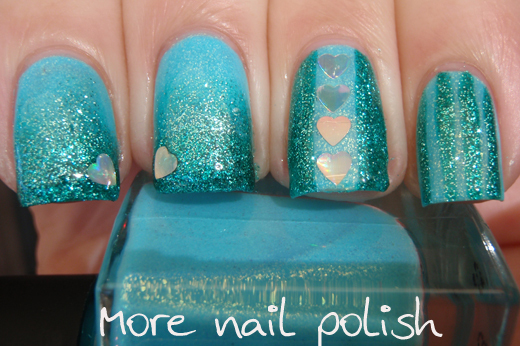 The glitter gradient is excellent as is the placed heart glitter. Great job!! This is beautiful! I love how you used Sea Jewel. It turned out amazing, even with such challenging colors! Gorgeous Cathy! We had almost the same colours! I love how you used Frosting! It was very creative!!! You did a great job and it wasn't easy with the colors you got! Gorgeous. I love the way you used the hearts. These 3 polishes are the ones I was hoping to use. I think it was quite a challenge for a number of people - I'm glad I'm not the only one who though so haha! But you definitely rose to is - these are freaking adorable. Hi! 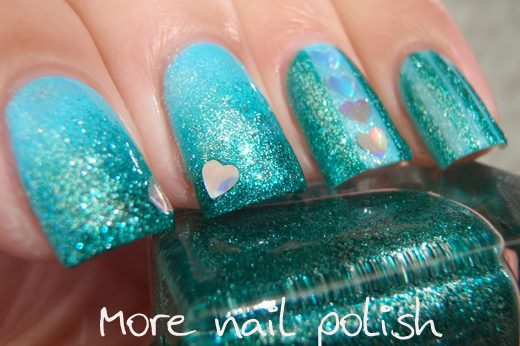 I love your participation is very pretty and the glitter gradient is well done. hearts are cute! Kisses and good luck!